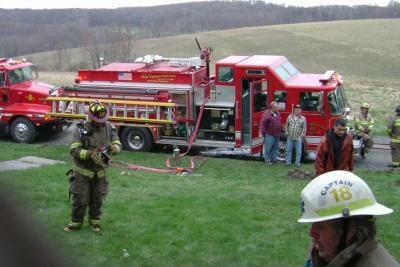 On Sunday at 1702 hrs a first alarm assignment was dispatched for a structure fire on Tennessee Gas Road, Clifford Twp. On the box were: E-18,T-18, L-18, 18-9, E-24,T-24 and a special call for E-52. Units began responding to the incident within one minute with Chief 18-1 (W.Turner) marking on scene of a two story wood frame residential, approximately 30'X40' with a light smoke condition. Command was advised by the home owner it appeared a fire had started around the chimney area and was spreading beneath the floor in division 2. The residence was constructed near the turn of the century which provided post and beam construction with heavy planked floors. Command assigned division 2 operations to E-18's crew. .
18 entered division 2 with TIC, PW can, irons and vent saw and began opening up. An 1 3/4" was stretched and put into service. Division 2 operations advised command the fire was knocked down and had extension traveling within the floor joist toward side D of the structure.